Tour of Italy Zebra Fundraising Tasting This Thursday! Continuing with our Al Fresco fundraising for the Zebra Child Protection Centre, next week, we have the Tour of Italy tasting at deVine’s on Thursday, May 31 from 7pm to 9pm featuring Italian wines from Vendemmia International Wines. Led by Jennifer Klinck and the staff of deVine’s, we will set up various stations with wines from every region of Italy from the North (Piedmonte, Veneto, Friuli, Trentino-Alto-Adige), Central (Tuscany, Marches, Abruzzo, Umbria), South (Campania, Sicily, Sardegna) and Specialty (Spirits and Sparkling). There are a total of 60 spots available for this standup, festival style event and less than 15 spots are left, so please register early online in advance for this event here.. You can also take your chances by showing up the evening of the event and purchase a spot at the door. Please take the time to fundraise for the Zebra Child Protection Centre by participating in next week’s Tour of Italy Festival as we lead up to the big day, the 4th Annual Al Fresco Block Party on Saturday, June 9th. In the meantime, please visit the Al Fresco Online Silent Auction that is in full swing. Items are continually being added and are also on display at the store. Only 60 spots available for this standup, festival style event and more than half of the available tickets have already been sold, so please register early online in advance for this event here.. There are two exciting fundraising tastings upcoming over the next two weeks in support of the Zebra Child Protection Centre – the first is on Wednesday, May 23 at the Yellowhead Brewery – 10229 105 Street. The doors open at 6pm and the music performances by Julia Adams, Erica Viegas and aroot’s bazaar begin at 7:30pm. 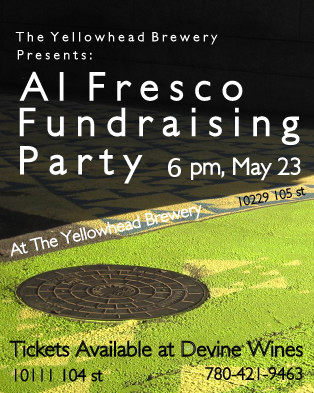 You can purchase your tickets for $10 at deVine’s (cash only please) or at the Yellowhead Brewery. Read the events pdf with details on the performers here.. The second event is on Thursday, May 31 at deVine’s from 7pm to 9pm entitled the Tour of Italy Festival, featuring Italian wines from Vendemmia International Wines. Led by Jennifer Klinck and the staff of deVine’s, we will set up various stations with wines from every region of Italy from the North (Piedmonte, Veneto, Friuli, Trentino-Alto-Adige), Central (Tuscany,Marches, Abruzzo, Umbria), South (Campania, Sicily, Sardegna) and Specialty (Spirits and Sparkling). Only 60 spots available for this standup, festival style event. Please register online in advance for this event here.. Please take the time to fundraise for the Zebra Child Protection Centre by participating in one or both of these events as we lead up to the 4th Annual Al Fresco Block Party on Saturday, June 9th. In the meantime, also visit the Al Fresco Online Silent Auction that is in full swing. Items are also being displayed at the store. Al Fresco Online Auction in Full Swing! The 104th-Street community is thrilled to announce Saturday, June 9 as the date of our 4th annual Al Fresco block party and fundraiser. Mark your calendars and save the date for an action packed day of fun and excitement in the downtown core! Please bookmark this url and come back often. Auction items will begin to be displayed at deVine’s starting the week of May 14th, please visit us. You can help us achieve our goals in many different ways. 1. Come downtown and celebrate with us on June 9. The restaurants, wine bars and food trucks will be donating a portion of their proceeds in support of Zebra. Net proceeds from the Downtown Community League Pancake Breakfast and the gate receipts from the “Tasting Lot” will be donated to Zebra. 2. Participate by bidding on our on-line silent auction. Last year, nearly $20,000 was raised for E4C’s Edmonton School Lunch Program. The on-line silent auction can be tracked on deVine Wine’s website at http://devinewines.ca/eventAuctions/alfresco_auction.html. Please bookmark this url and come back often, the online auction starts Wednesday, March 28th. 3. Donate an auction item. We are seeking auction items to make this our most successful to date. If you are interested in donating an item to the auction, please fill out the in-kind donation form and then email the completed form to Ed here. Prior to Al Fresco, these items can be dropped off at deVine Wines and Spirits at 10111-104th-St. We will have drop boxes set up at the Zebra Information Table on the day of June 9 to receive any “Top 5 Wish List” donation items as well. 5. Make a cash donation. Please fill out the donation/tax receipt form here and then email the completed form to Ed here. Sometimes, you have no expectations and then are blown away – well that happened when Annabelle and I visited Maya, a Mexican Restaurant owned by famed Richard Sandoval on the Upper East Side of Manhattan a couple of days ago. We had read a few excellent reviews and it was within walking distance of our condo location, so we made a last minute reservation and dropped over. us have ever had. The corn was exceptionally sweet, the texture velvety and silky, and pure, no starch agent added to thicken the soup. Speechless! For mains, Annabelle had the Carnitas Maya (pork tenderloin on top of pulled pork shoulder with avocado puree, black bean-requeson huarache and red onion-orange salsa. The meat was so tender it melted in your mouth. Flavors were explosive yet nothing overwhelm the other. 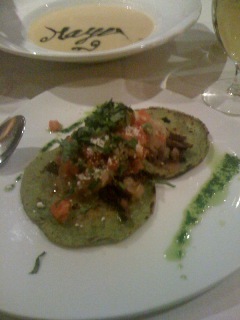 Nicely accompanied by saute spinach, huitlacoche dumplings (corn fritters), and panfried plantains. Delightful. I partook the Langosta y Camarones (lobster and adobo marinated shrimp, creamed corn, watercress, chile de arbol vinaigrette and habanero rouille). Corn is a specialty of this house, it is masterfully done, the seafood perfectly grilled, the side dishes adding contrasts that challenged the taste buds while the whole package left me wanting more. For dessert, Annabelle had Churros (a Mexican fried pastry sprinkled with cinnamon and sugar, and accompanied by Mexican hot chocolate and caramelized goats milk). Delectible! I had a Martini Espresso made from Patron XO Tequila, espresso coffe, citronage orange liqueur topped with roasted coffee beans. Not a Michelin starred restaurant, but it should be – the most splendid Mexican food we’ve ever tasted. Can’t wait for the upcoming cookbook that features these dishes. Here is the link to Maya.